Congratulations on your engagement! 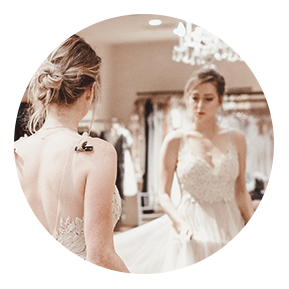 Finding your gown should be a stress-free & joyous occasion; this guide will help prepare you for what to expect at your BHLDN gown appointment. Your BHLDN Stylist will greet you and your guests upon arrival. 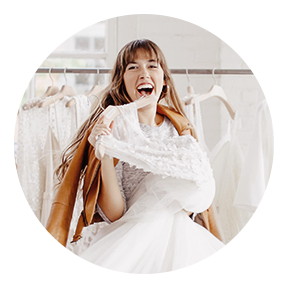 You’ll chat about your favorite gowns (which you list when booking your appointment), wedding details, budget and timeline needs, and where you are in the shopping process. Your stylist will pull any additional gowns that catch your eye in the gown gallery. From there, you’ll head to your reserved appointment area. If there’s time, your stylist will help you into your top gown for another look. 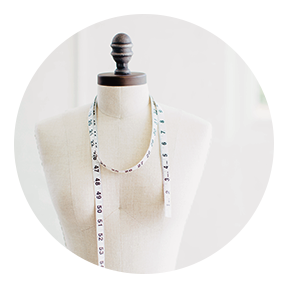 If you’re not ready to say “yes” the day of your appointment, we will keep your measurements and size recommendations on file so you can call and order when you’re ready. Most gowns will need some alterations, but we will ensure that you know what size is best for you given your unique measurements and the alterations that may need to take place. 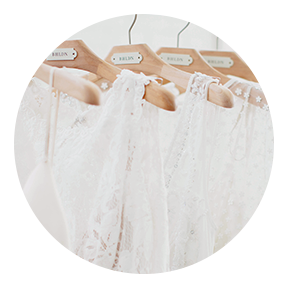 BHLDN does not offer in-store alterations, but your stylist can provide a list of preferred tailors in your area. • Arrive 10-15 minutes early to ensure your appointment starts at the scheduled time. • Your stylist will clip and adjust each gown to fit your unique figure. Each shop carries 1-2 sample sizes. • Not every one of our gowns online are available in stores. If you have questions about a specific gown, be sure to contact your shop ahead of your appointment to see if it’s available. Happy Shopping! You’re going to look beautiful.